Georgina Godley's sculptural designs reflect her training in fine art. 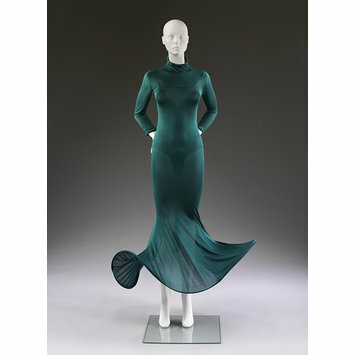 This fluid, semi-transparent dress skims the body until it flares at the hooped hem. The neck and wrists are also emphasized with boned hoops. It was designed to be worn with a bodystocking dyed to match the silk jersey. Godley challenged conventional notions of femininity by featuring decorative padded stomachs and bottoms in some of her most radical designs. 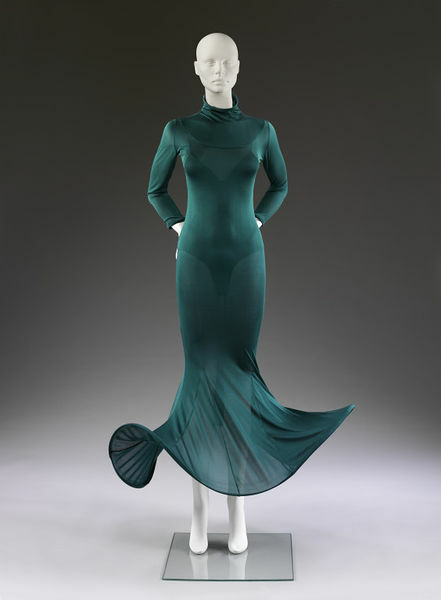 Semi-transparent green dress in silk jersey, and with boned hoops at the hem, neck, and wrists. With bodystocking dyed to match the dress. De La Haye, Amy, ed. The Cutting Edge: 50 Years of British Fashion 1947-1997. London: V&A Publications, 1997. pp. 30 and 204. The fluid semi-transparent dress fits the body like a second skin, with godets allowing it to flare out at the hem. The neck and wrist-edges and the hemline are emphasised by boning. It is worn simply over a body stocking dyed to match the silk jersey. Georgina Godley maintains a reputation for radical and highly innovative design.